There are plenty of great musicals out there, and as a result there are plenty of age-defying hits that will simply always need to be sung. One of my favourites – and I know I’m not alone in this – is “Jersey Boys”, the tale behind the formation, success and eventual break-up of 1960s rock n’ roll group The Four Seasons. 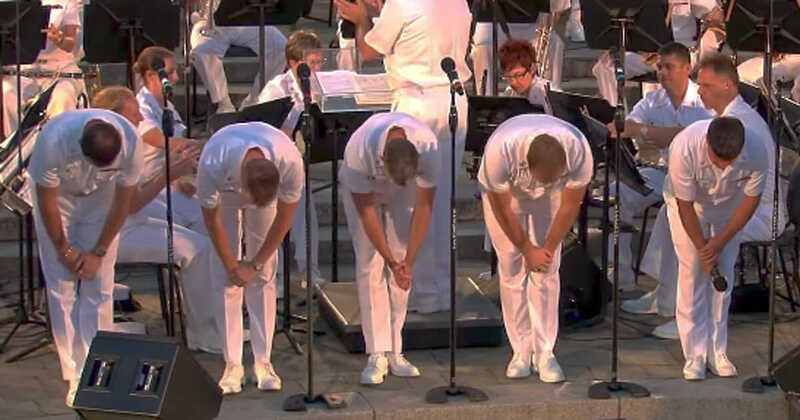 The musical itself boasts a number of hits, and here they’ve been covered expertly by the talented men of the United States Navy’s chorus. You might not know it – I certainly didn’t – but the United States Navy has its own dedicated band, one accompanied by a highly skilled chorus. Named the “Sea Chanters”, they’ve been around for 60 years, having initially been founded by Lieutenant Harold Fultz and a small group of Navy School of Music students vying to sing at the State of the Nation celebration. Nowadays, the chorus is an incredibly impressive and established formation, one boasting dozens of members who come together to generate pitch-perfect harmonies. The Sea Chanters have made a name for themselves now as a group that actively travels far and wide with their talent, and they’re well received in whatever corner of the world they’re playing in. So when they decided to perform a cover of tracks from “Jersey Boys”, it’s no surprise that the result is truly breathtaking. You see, the Sea Chanters are aware that none of them on their own can hope to be as powerful as the accumulated strength of them all. Which is why they actively work together to bring the absolute best out of the united front. Such talent should always be praised where it’s found. Share this article if you think the Sea Chanters should cover more classics!